TheIndigenous People of Biafra (IPOB) has said its leader and Director of Radio and Biafra Television, Nnamdi Kanu, is not on the run, contrary to claims from some quarters. 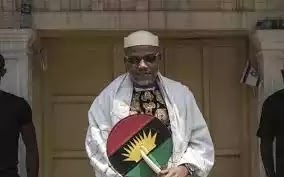 IPOB Media and Publicity Secretary, Emma Powerful, who said this in a statement issued in Enugu State, added that it was mischievous for any person to insinuate that Kanu would be on the run. “The thugs hired to peddle the rumours should be the ones hiding from IPOB not us from them. “It is unfortunate that some people in Arewa North do not know who Mazi Nnamdi Kanu is hence, they keep coming up with laughable fabrications, designed to demystify our leader, to no avail. “Mazi Kanu, they privately acknowledge, knows no fear and is undeterred by side rantings of the vocal parasitic few, who cannot imagine their existence without crude oil money coming from Biafraland. Powerful noted that Kanu had reiterated several times that he will not go on exile, no matter the threat. “IPOB is, till date, the most vibrant, indomitable and intelligent mass movement the world over. “We are intellectually light years ahead of little silly mind games. “IPOB and Kanu cannot be intimidated by anybody, or group, no matter how highly placed they think of themselves. “Our mission is to restore Biafra and nothing under the sun can stop us. Powerful added that Biafra agitation will continue until government fixes a date for a referendum to settle the issue, in a civilised and democratic manner.